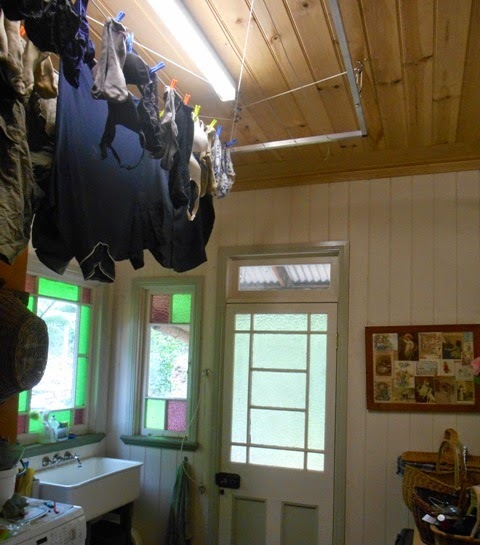 I'm a great believer in all washing being hung on the line, and I rarely use a dryer. 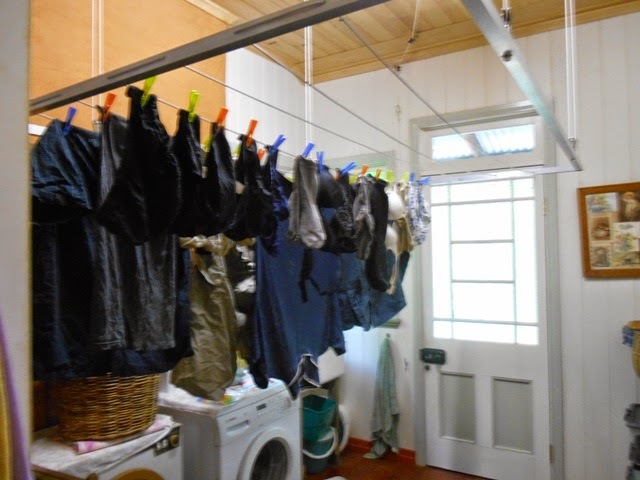 But we get a fair amount of wet weather on the mountain, and endless days of rain and high humidity are not conducive to drying multiple loads of sheets and towels. 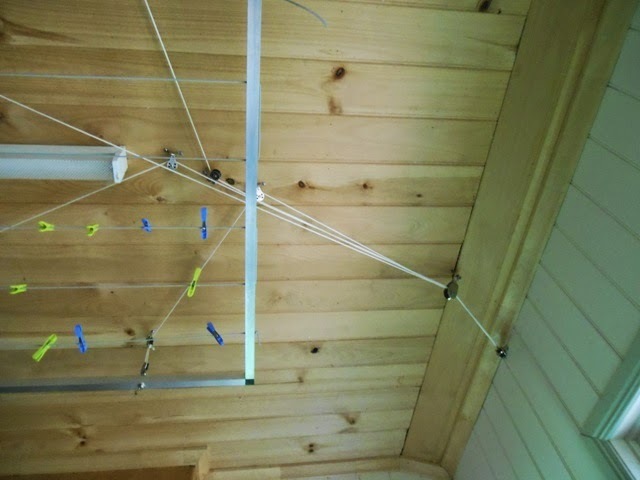 Russell built this drying rack which can be lifted by a pulley system up to the ceiling. By adding a dehumidifier in the laundry, we have a solution that can deal with a fair amount of washing in a reasonably short time, and without the expense (and constant loading/unloading) of a dryer. The rack is made from 25.4mm square section aluminium channeling with click-together corners, all from Bunnings. A series of pulleys make it easy to lift even a full load. Russell sourced the pulleys on the web, much cheaper than he could buy them locally. In the lowered position it's easy even for short people to reach! 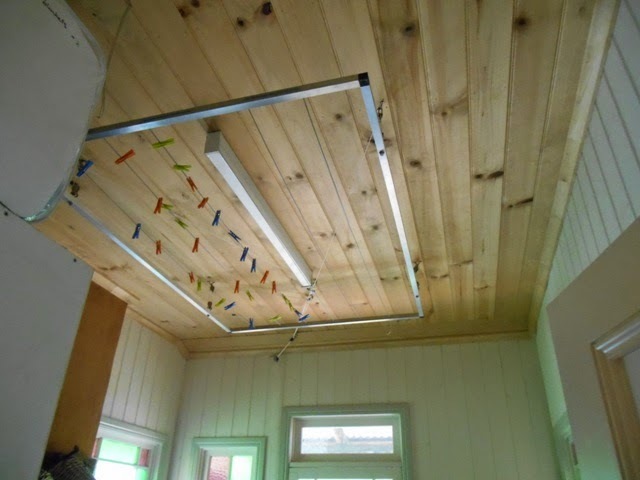 Once it's pulled up, it's well out of the way (it helps to have 2.8m ceilings). 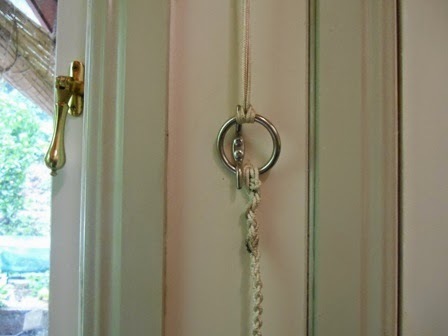 A couple of rings on the pull rope, plus cleats on the wall, mean it can be easily held at either the two loading positions (one for short people, one for tall!) or the drying position. You need to have a closable laundry for the dehumidifier to be effective. Dehumidifiers run on considerably less power than a dryer. Buying a dehumidifier on Gumtree for less than a third of retail price was a bonus!